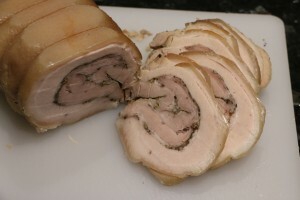 Rullasyltty is a spiced rolled pork belly, available year round, but also a popular part of the Finnish Christmas table. The dish is particularly well known throughout Denmark and Sweden. Whilst in Finland one can readily buy the prepared dish, here we have to make it ourselves. Recipes vary as to the herbs and spices used, but we have used our own recipe for many years now and it always turns out well. The first task is to source a good piece of pork belly. We are fortunate to have a good local butcher, providing free range pork. A piece of 2kg or so is a good size to work with. Large pieces such as this often come with the ribs attached. These need to be removed, leaving as much meat as possible. 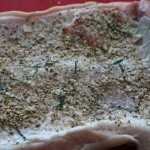 The ribs can be used elsewhere or added to the cooking pan, where the bones impart flavour to the stock. The next task is to trim any particularly large fat deposits, then open up the pork belly by carefully cutting between the layers of meat. This allows the spices to be spread throughout the roll. 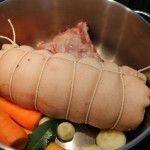 The spices are then rubbed into the meat and the belly rolled and tied tightly with string. The rolled pork belly is placed in a pan, with a few more spices, along with a couple of carrots and onions. Covered with boiling water, it is simmered for 2 to 3 hours. To check whether it is ready, insert a skewer through the centre – if there is much resistance, leave for a while longer. Once cooked, leave tied, and press beneath a weight of some sort. I usually place it in a tray, put a chopping board on top, squash it down somewhat and tie the board in place. 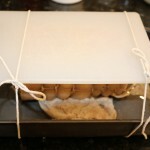 Leave to cool for 30 minutes or so before transferring to the refrigerator. Some cans or jars can be placed on top to weigh it down. 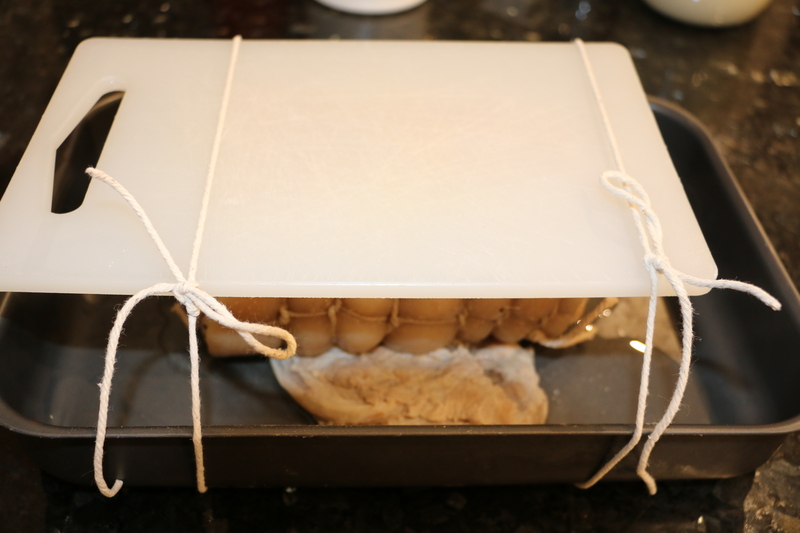 Once the pressed belly is completely cooled, the string can be removed, and it is ready for slicing. The stock can be reserved for other purposes. Trim any ribs from the pork belly, along with any excess fat. Carefully open up the belly, making sure not to cut completely through. Shred 2 fresh or 4 dried bay leaves and combine with the salt, white pepper, ground ginger. Crush half of the allspice berries and add to the other seasonings. 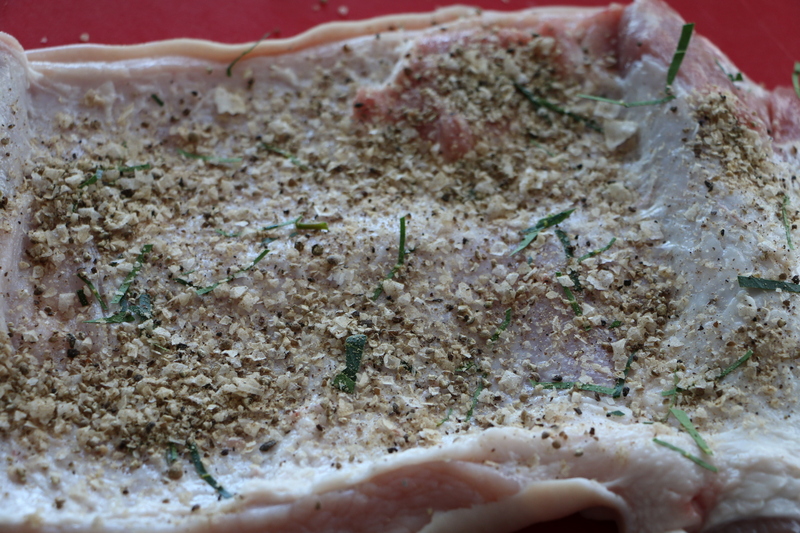 Rub the spice mixture into the meat. 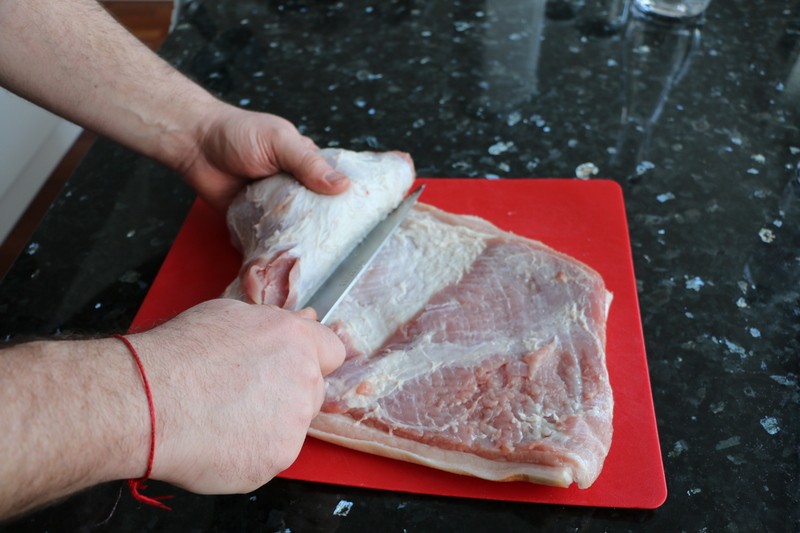 Roll up the pork belly, and tie tightly. Place in a pan with 1 fresh or 2 dried bay leaves, the rest of the allspice berries, the carrots and onion or shallots. 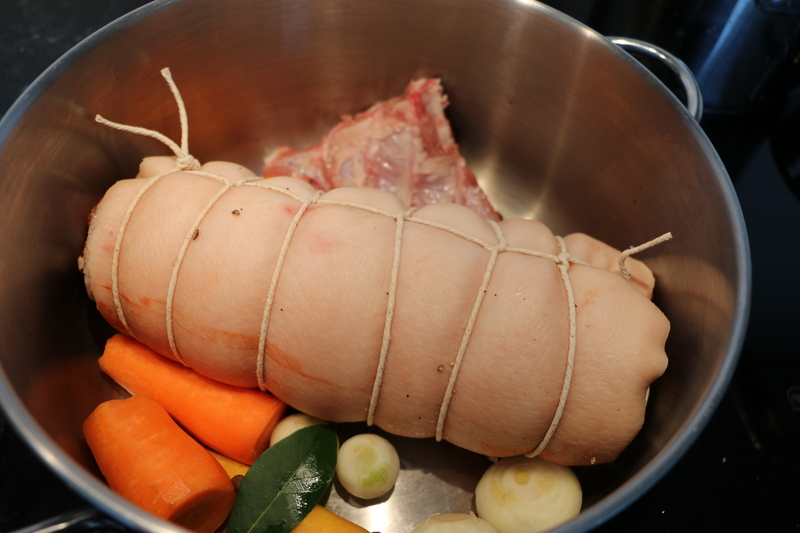 Pour over boiling water and simmer the pork for 2 to 3 hours, until tender, keeping the water topped up as necessary. Transfer the pork from the stock to a tray, place a board on top, and press overnight, moving it to the refrigerator after cooling for 30 minutes. Remove the string and slice thinly.